One of the great things about legendary doom metal band Candlemass, and why I like them, is that they're the most un-doom metal band. Candlemass delivers their eleventh studio album, Psalms of the Dead, and founder and bassist Leif Edling has said it will be their last. However, the band is not splitting up, at least not yet. Candlemass: doom in the gloomy forest. Yeah, you read that right, and why? Edling told Terrorizer magazine, '... we want to stop before we get too old and start putting out half-lame albums. Instead, we'll slowly fade away into the sunset with our dignity intact. We're not young anymore.' Perhaps this is sage wisdom for other long serving bands. But, back to my original premise of Candlemass being a very un-doom doom metal band. Certainly they are doomish, in the very classic sense, and you can hear it in every song, especially Waterwitch or the title track. But since they were also born in the great metal Eighties, and they temper their gloomish doom with the element of traditional melodic heavy metal. And then there are those big riffs and ripping guitar solos. Nice. Or, in point of fact, for the un-doomish, there's Dancing in the Temple: it's doom with speed and a rock groove. Go figure. Conversely, epic and heavy doom metal, in the very best tradition, arises on The Lights of Thebe, Prophet, and Black As Time, by example. That last song offers another tangible taste of classic heavy metal, without foregoing the foreboding doom. Frankly, it's all good. 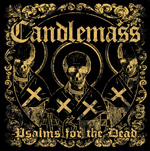 It's hard to believe that Psalms of the Dead will be Candlemass' last effort. They should at least get to the 'lucky' thirteenth. How doomish would that be? Nevertheless, if this is their doom swan song, then it's a good one. Clearly recommended. The band says Psalms of the Dead is the last Candlemass album. If this is the end, it's a quite entertaining, epic, and doomish end.